Quick question for anyone who might know... Is Ozone - O3 itself - by definition "plasma"? My understanding is that it exists as a "charged gas", and I assume that if it relinquished its charge it would degrade into O2 and (I assume) monatomic oxygen. If it is plasma, and I'm really hoping someone can confirm or negate that assumption, but if it is - wouldn't that go a long way towards explaining the "hole" or thin area over the South Pole? I mean, don't we see the same torus-like plasma behavior again and again around globes? Depends on how one defines plasma. 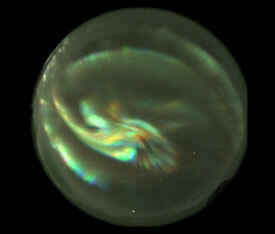 Total Science wrote: Depends on how one defines plasma. I'm thinking "electrically charged gas" would cover it, although I should probably be more detailed. My question is basically since (as I understand it, and hope I'm not wrong or this whole question is moot) Ozone is by its nature an electrically charged gas, does it not then behave as a plasma - because it is one? I have no idea where I saw the info or in what article, but I'm pretty sure that I saw someone mention that ozone is a 'heavy gas', and it was under discussion as to how it can hang up there in an 'ozone layer' in the first place if gravity was pulling it down through less dense atmosphere. "'Jellyfish' in the aurora is a petroglyph-like phenomena"
"Colliding Auroras Produce Explosions of Light"
"Aurora with No Solar Wind"
"Plasma Bullets Spark Northern Lights"
Recently I have been reading "The Autobiography of Science," published in 1945 (Doubleday), and edited by R. Moulton and J. Schifferes. The book is a combination of short bio information about important people in science followed by original writings by that same person in their field of work. Of interest I believe is this comment about John Dalton ( 1766-1844 ). "Further, he kept a meteorological diary and was familiar enough with the phenomena of electricity to assert, correctly, in 1793 that the aurora borealis, that colorful display of northern lights, was electrical in origin." John Dalton was an important scientist in the advancement of chemistry and the study of color blindness, which has been called "Daltonism". I Think it would be a good idea to "fill in", so to speak, the history of the belief in the electrical nature of our surrounding environment, especially from those people that have standing in the "scientific community". A beautiful view from the ISS. I'm sure it's just my imagination but it did look like there were tiny hints of structures that wouldn't look out of place on the sun. 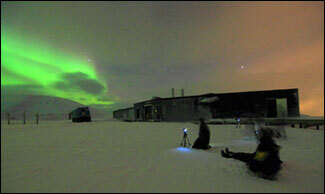 U.S. launches rocket at Auroras! Here, a two-stage suborbital rocket rips across the auroras over Alaska. The small rocket was launched by scientists Saturday as part of a NASA-backed study into how auroras can affect signals coming to and from satellites and spacecraft. Scientists hope to better understand the way space weather impacts our electrical systems on Earth and in orbit in order to possibly mitigate those effects as the sun builds toward its solar maximum in 2013. The team used a 46-foot sounding rocket (known as a Terrier-Black Brant) to gather data across a 6-mile-thick layer of the Earth’s upper atmosphere where incoming charged particles from the sun interact with the Earth’s magnetic field and atmosphere. Known as a theta aurora -- because seen from above it looks like the Greek letter theta, an oval with a line crossing through the center -- this type of aurora sometimes occurs closer to the poles than normal aurora. While the genesis of the auroral oval emissions is reasonably well understood, the origin of the theta aurora was unclear until now. A paper in the Dec. 19, 2014, issue of Science shows that hot plasma funneled into near-Earth space from the sun helps cause these unique aurora. The mystery was finally solved by studying data collected simultaneously by the Cluster and IMAGE spacecraft on Sept. 15, 2005. 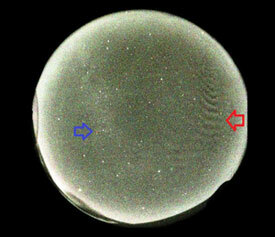 While the four Cluster satellites were located in the southern hemisphere magnetic lobe, IMAGE had a wide-field view of the southern hemisphere aurora. As one Cluster satellite observed uncharacteristically energetic plasma in the lobe, IMAGE saw the arc of the theta aurora cross the magnetic footprint of Cluster. The team found that the energetic plasma appeared on high-latitude magnetic field lines that had been closed by the process of magnetic reconnection driven by the northward pointed fields. This in turn caused the plasma to become relatively hot. Such observations support the idea that theta aurora are due to plasma trapped inside the magnetosphere, rather than material being directly pushed in from the solar wind. "Solving the question of the origin of the theta aurora required Cluster’s high inclination orbit that sweeps over the region where the aurora are generated together with the imaging capability of IMAGE, which is no longer functioning," said Melvyn Goldstein, Cluster project scientist at NASA's Goddard Space Flight Center in Greenbelt, Maryland. "Hopefully, future missions will give comparable capabilities to view the polar regions of the magnetosphere." It is a bit of a stretch perhaps, but still. Now, I cant be sure if its ascending into the sunlight, or descending, but I'm pretty sure its descending. The glow becomes quite strong after the five minute mark. More interestingly, bright concentric cylindrical shells begin to manifest themselves. Looks to me like a strong glow mode enhanced by the possibility that the rocket is creating a path of least resistance for the current, but I would like to hear other opinions. What is a sounding rocket? Why?